Roelof Erasmus van der Merwe (born 31 December 1984) is a South African cricketer who plays domestically for Titans and has represented South Africa in Limited overs cricket. He is currently signed by the Delhi Daredevils for the Indian Premier League. He is a right-hand middle order batsman and a slow left-arm orthodox bowler. Born in Johannesburg, van der Merwe made his List A debut in October 2006 for Northerns against North West. He was dismissed for a duck and bowled his full allocation of nine overs conceding 29 runs. In December 2006 he made his first-class debut for Northerns against Limpopo he bowled 12 wicketless overs but scored 36 runs and took three catches. Van der Merwe had a successful 2007–08 season, moving into franchise cricket with the Titans. He made his debut for Titans in the SuperSport Series in November 2007 against the Eagles. His first one-day appearance for them came in February 2008 against Zimbabwe he claimed four wickets conceding 24 runs (4/24). He finished the MTN Domestic Championship as Titans leading wicket-taker with 27 wickets at an average of 14.25. He also scored 269 runs at 29.88. In the Standard Bank Pro20 Series which followed van der Merwe was the third leading wicket-taker with 13 victims at 13.92, he also contributed 192 runs at 27.42. Titans won both 50 over and 20 over competitions and for van der Merwes part in it he was awarded Player of the Year, MTN Domestic Championship Player of the Year, Standard Bank Pro20 Series Player of the Year and the Newcomer of the Year at the teams end of season award. On a national level he was selected Domestic Newcomer of the Year at the SA Cricket Awards. Titans retained the MTN Domestic Championship in 2008/09 with van der Merwe again being instrumental to the success, he took 30 wickets at 13.96, 14 more than any other bowler. In 2007 van der Merwe played for Monton & Weaste in the Central Lancashire League before he was released mid season after the club realised he wasnt eligible for amateur status having played first-class cricket the previous winter. He has also represented Stretford, in 2006 he scored a league record 1200 runs at 80 as well as taking 53 wickets at 11.26. 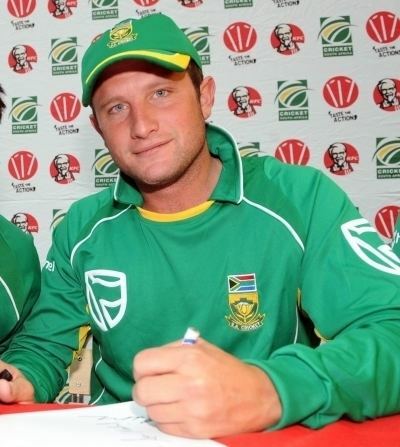 Van der Merwe was selected in the South Africa team for the 2004 U-19 Cricket World Cup, he played five matches, scoring 129 runs and taking 3 wickets. Following the tournament it was over two years before he made his first-class debut and van der Merwe has admitted he "didnt take things too seriously" and was "partying all the time". In August 2008 van der Merwe was selected for the South Africa Academy to play against their Bangladesh equivalents, in the second of a five match series he scored 79 from 70 balls and took 6/52.